My Converse All-Stars (better known as Chuck Taylor or Chucks) and I have been on many adventures. Together we have conquered Disneyland, Sea World, Universal Studios, family vacations, shopping excursions, quick errands to the grocery store, trips to numerous museums. They even went with me each time I volunteered at the hospital. The list is endless. Our relationship has grown to be very deep...to say the least. It would be hard to live my life without my Chucks because they meet my qualifications...they are classic, comfortable and cute! To be quite truthful, I'm not much of a sneaker kind of girl. I much prefer sandals, however, Chuck brings something entirely different to the table. Unlike other sneakers, when I place my Chucks upon my feet, they instantly come alive. I feel the sudden urge to run and leap! 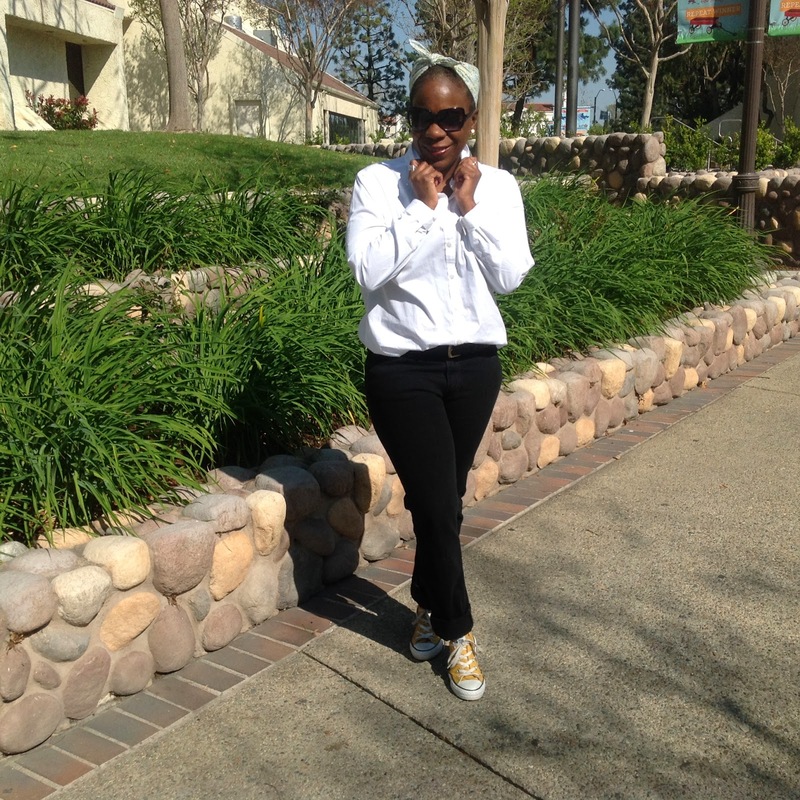 When wearing my Chucks, my sons view me differently - I am transformed into a hip mom. 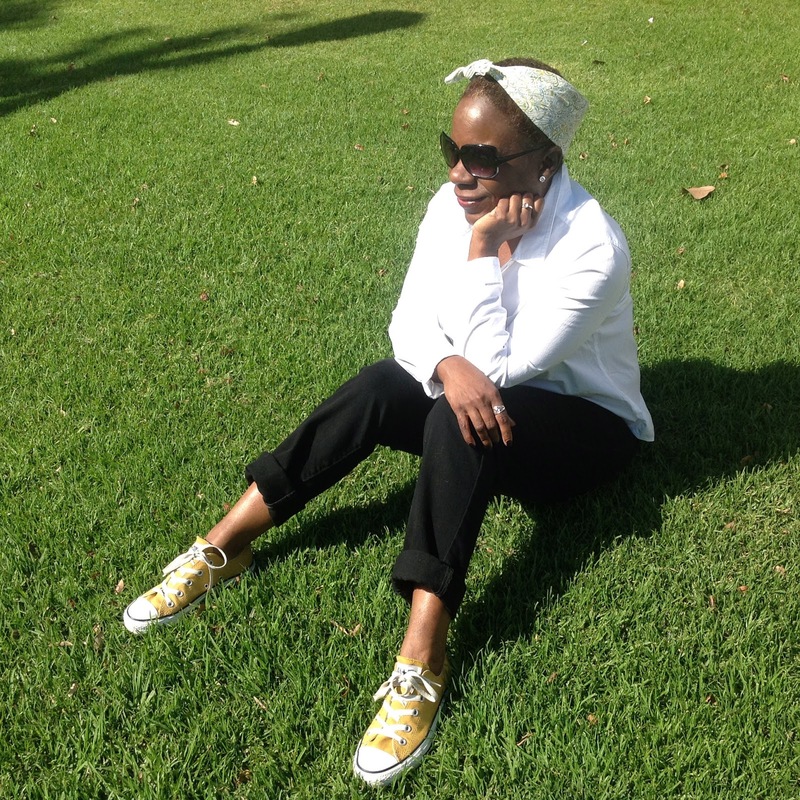 In their cheerful golden color, my Chucks have brought much sunshine to many of my wardrobe pieces...shorts and breezy tops, fun skirts, whimsical summer dresses and of course, denim. While everyday trainers could positively ruin an adorable outfit, Chucks have the ability to bring a bit of fun and quirkiness to an ensemble. Once while visiting the Getty Center (one of Southern California most amazing museums), I sat with my family and enjoyed a cool drink. I noticed a woman dressed in one of the cutest outfits. As I gave her the once over, my eyes came to a screeching halt when I saw her choice of shoe...paired with her Oh-So-Adorable ensemble was a pair of gym shoes. No! I wanted to shout. I understand the need for comfort, considering the Getty is an enormous place to visit, however, what I couldn't relate to was the idea of destroying a perfectly feminine outfit with a pair of bulky gym shoes. Keep scrolling. The following post is called Video Fashion Friday: Revisiting Kate. I'm sure you'll enjoy it! 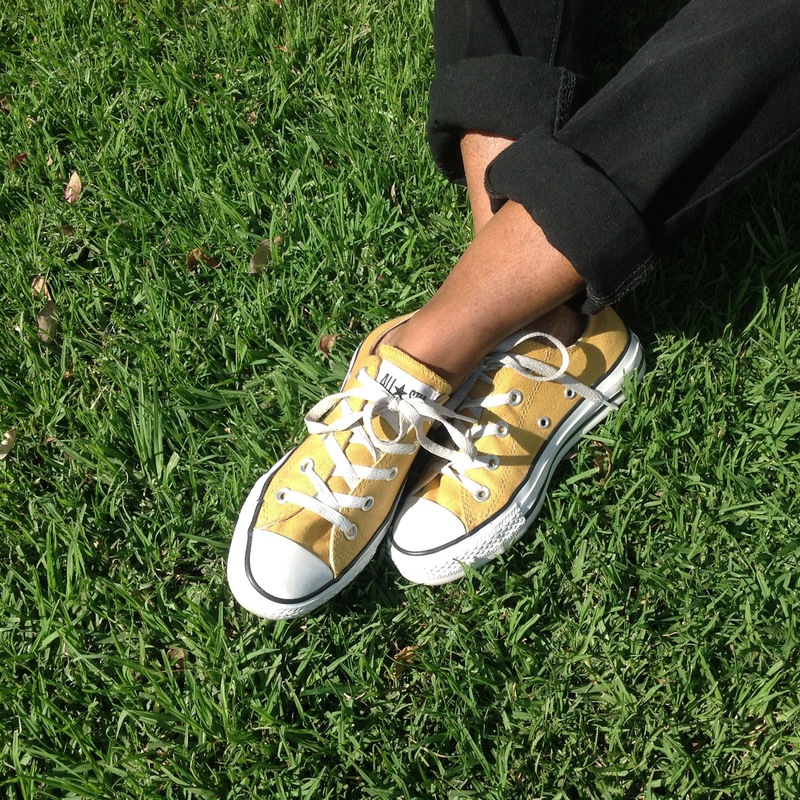 Your yellow Chucks are nothing short of fabulous. You definitely have a spring in your step! You look great and thanks for sharing with Visible Monday. Love this! And I am so with you on the gym shoes! Why, why, why when there are so many cute and comfortable options! I cant figure it out Daenel. My Chucks are purple. I love those things, but I barely wear them here on the island. It's always sandal weather. You make me want to knock the dust off of them. Love the look and the attitude - your blog title is great! How do you keep such well-travelled sneakers looking so pristine? Aw yes Ariane, I can see you rocking the DrMartens! Yep Sharon...not a good idea to wear them with everything. And yes...LONG LIVE CHUCKS! Glenda you look great!!! Love the chic yet casual look on you. 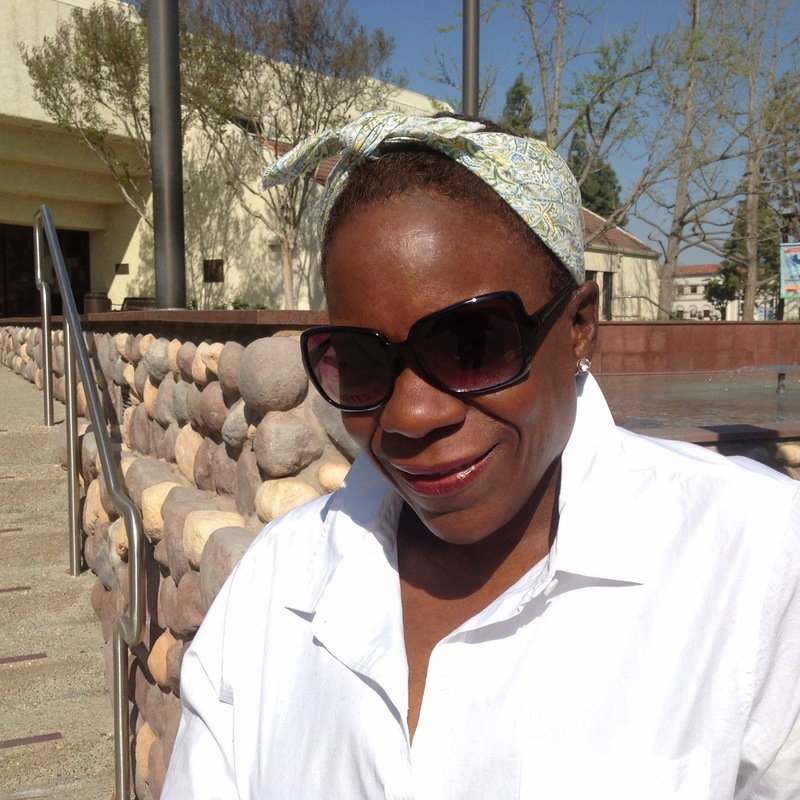 Your head scarf is THE accessory!! Turns your outfit into that Glenda_ish style. Hope that makes any sense at all. Yes it is the other bangle I got on Val's day. I love your look and I love your leap! There's a whole lot of jumping going on, here and at my place too. It's clear to see why. Nothing like a little zesty citrus on your feet. Ha, you're right, today is the day for leaping! Hi lovely Glenda. I will go through all your post. But cannnot comment on everyone due to time lack. I like your all stars very much. And they are so comfortable to walk in as well. Two bonusses. By the way.. great jump picture. And you jump pretty high. Thanks for commenting Greetje! My legs ache today for jumping to get just the right shot. 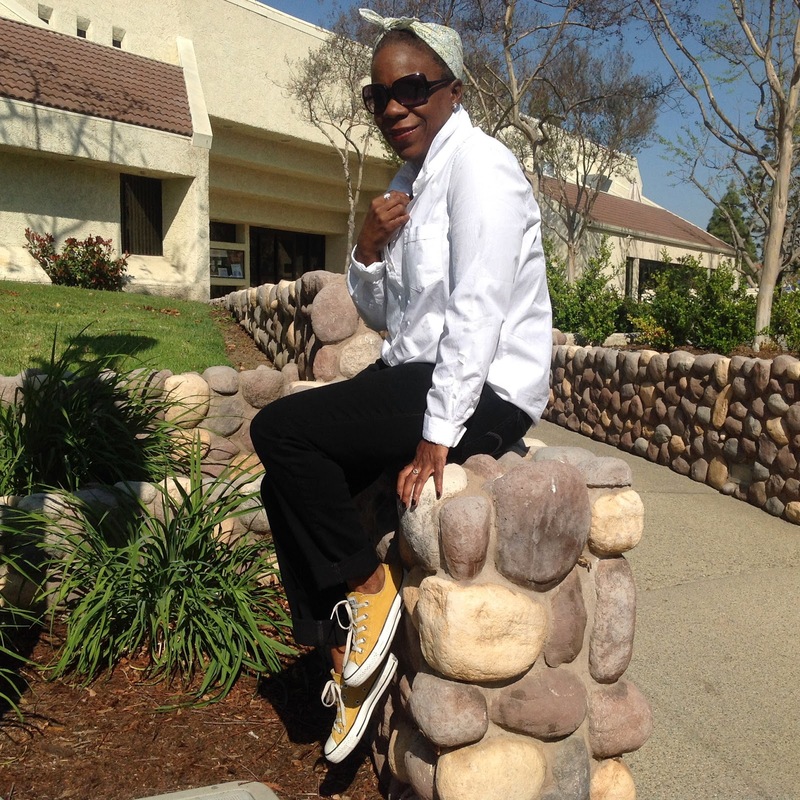 Love your sunny yellow Chucks! I have an ivory/white pair but think some color would be a lot of fun. Darling shoes, Glenda. I love your posts. Renae, thank you. That really touchrs my heart. Oh Glenda, I adore your relationship with Chuck. I must confess I have a Chuck relationship going strong in my world as well. He's been my traveling companion on most of my vacation spots, he even found a place in the suitcase to Paris, England, Italy and Greece and has never let me down. But I must say, your yellow Chucks have one on my gray and/or black. Wow, to Europe...that Chuck is amazing! <3 Converses! You look great in them, very youthful and playful :-) I really enjoyed the pictures. This was a fun photo shoot. I think my husband had fun too! Love this casual chic look....and your shots are so fun!!! Hi Mrs. C and thank you for dropping by. It's good to read that Chucks are a tradition in your family. Action photos! Love it ... anything that spurs one into action is a very good thing, especially in midlife and especially for women! Pretty in yellow. Chucks have indeed evolved, haven't they? Perfect for your outing, as well. Hi Jan, my legs were sore the next day so I had to do some intense stretching exercises. It took a lot of jumping to get the right shot! And yes, Chucks have evolved. I love them! Looks like you had fun taking these pics! I love my chucks the are so timeless and I like the addition of more colors over the past few years. I had a great time on this photo shoot! Chucks, always... for the win! I seriously love how versatile they are! You are gorgeous! Thank you Cara. And so are you! 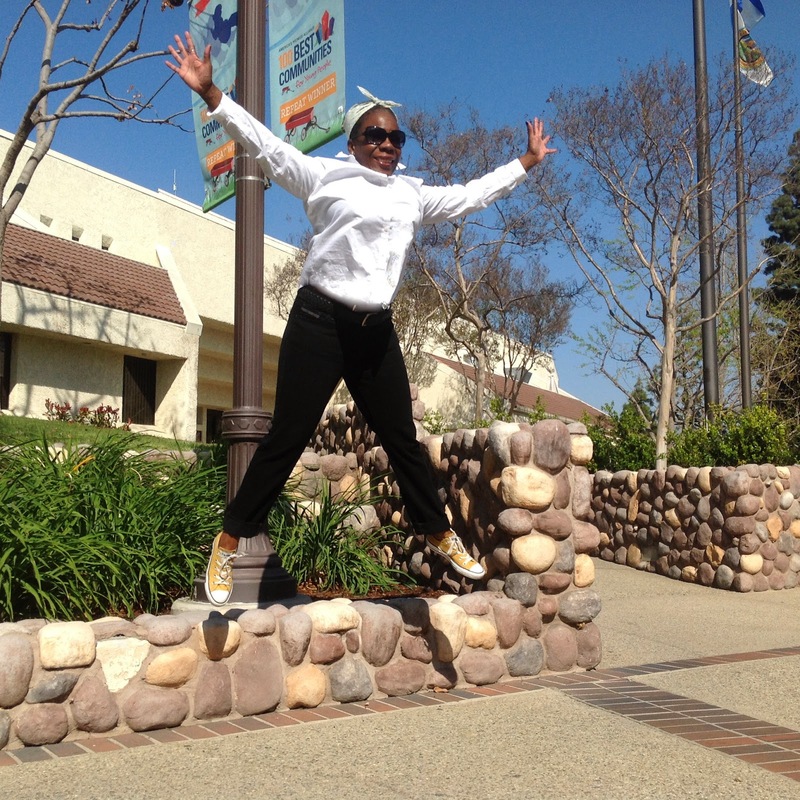 Glenda, I love you in your golden chucks! I hear what you arresting about this silly trend but I think it seems fun, and am about to plunge in, sneakers first.. it won't be my first, and look. I love these photos, and love the scarf in your hair. So wonderful to see you leaping with joy!! It will be interesting to see where this sneaker trend takes us. One thing for sure, the Chucks will be around a long time! I meant saying and not arresting..
My son has a pair of blue ones and they reminded me of being in Jr. High - I think they are cute especially the color - yellow which is one of my favs! Yes, yellow is such a happy color! I definitely know that feeling when you find a pair of comfortable sneakers that work with every look and more. Like a friend, they are there when you need them. Nice post and very cool shoes. Love the chucks. Sometimes it's nice to switch it up a bit. You look super cute and casual...xo! Thank you Whitney! I felt relaxed and at ease. Love the mustard yellow Chucks! Adorable pics!